Austin, Texas — Preservation Texas, Inc. has announced that the Hotel Settles in Big Spring will receive a 2016 Honor Award for Restoration on February 18, 2016. The Honor Award will be presented at a special ceremony at the historic State Theatre on Congress Avenue in Austin as part of the Preservation Texas 2016 Summit. Abandoned for thirty years, the landmark hotel designed by architect David S. Castle and completed in 1930 was at one time the tallest building between El Paso and Fort Worth, hosting famous guests from Elvis Presley to Herbert Hoover. Owner G. Brint Ryan and his team, including Norman Alston Architects, made painstaking efforts to preserve historic materials and incorporate new construction consistent with historic conditions. 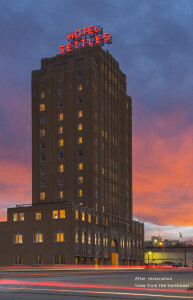 Adapted for 21st-century use, the Hotel Settles reopened in 2013 and represents the potential for similar abandoned buildings of the 1920s and 1930s across Texas.